Street food has become hugely popular in the UK. With countless markets and street food stalls being set up all over the place, it’s never been easier to try foods of the world without having to venture across borders. 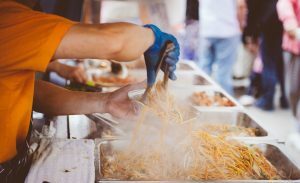 With ever changing flavours, textures, combinations and colours, street food is an exciting way to try something outside the norm, or for authentic tastes from abroad. Here is a list of the typical street food dishes you can expect, from a variety of countries. The second largest country in South America, Argentina is known for its Empanadas. 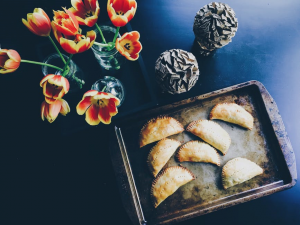 Served occasionally sweet but mostly savoury, empanadas are a type of pastry stuffed with a wide array of fillings and baked or fried. These delicious little pastries are incredibly versatile and can be filled with meat, veg or even a sweet fruit. 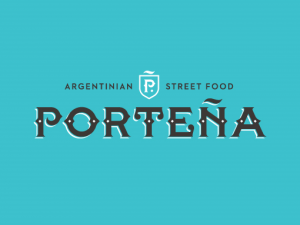 For a taste of Argentina, take a trip down to Borough Market in London and visit ‘Porteña’, where they serve traditional Argentine empanadas with hearty fillings. Here in the UK we’re no stranger to a Chinese takeaway, and the possibilities with street food are nearly endless. But a popular choice, given it’s probably one of the tidiest Chinese delicacies, are Dumplings. 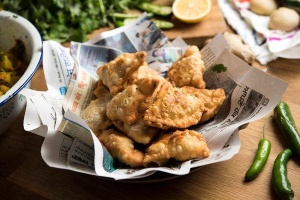 Generally filled with ground meat such as pork or beef and wrapped in thin dough, Dumplings can be steamed, boiled or pan fried. 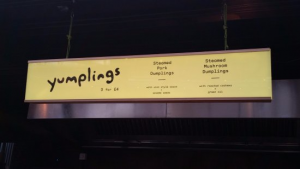 For the perfect dumpling, take a trip to Dinerama or Hawker House in London to visit Yumplings. 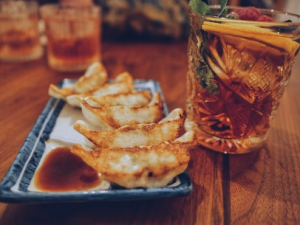 Specialising in perfect steamed dumplings, chow down on pork or mushroom dumplings with some spicy sauces. One word, sausage. It would be virtually impossible to come across a German street food vendor that didn’t include either Bratwurst, Currywurst or both. 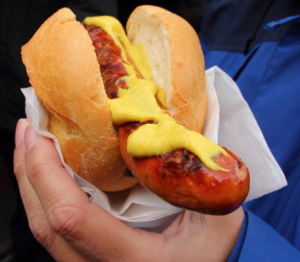 Bratwurst is a German white sausage served in a bread roll usually with ketchup and mustard. Currywurst on the other hand is seasoned with ketchup, topped with curry powder and usually served with chips. The dish is so popular there is even a Currywurst museum in Germany’s capital. A little less well known but likely just as popular is the German spin on the Doner Kebab, sliced meat and salad all crammed together in a pitta bread. 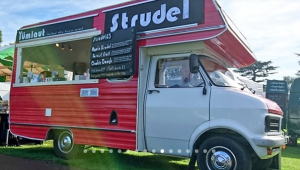 German food truck ‘Yumlaut’ travels the country offering these German specialties. Look them up or follow them on Twitter to find out where they’ll be and when. 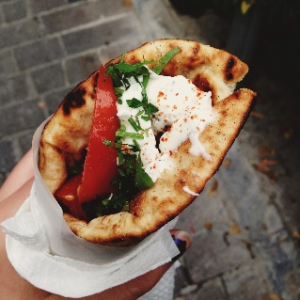 Known for their Moussaka and Spanakopita, one of the Greek dishes that probably lends itself best to street food is Souvlaki. A popular Greek delicacy consisting of small meat pieces and occasionally vegetables, Souvlaki can be served on the skewer on which the meat is grilled or in a sandwich or pitta. 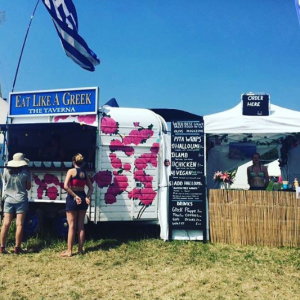 ‘Eat like a Greek’ is a Greek street food van that can be found regularly in markets across Bristol and the South West. Their specialty? Souvlaki! Pork, lamb, chicken and beef, Eat like a Greek serve locally sourced food marinated in spices and oils from their family farm on the island of Samos. Another country with countless street food options, the most typical would be either Samosas, Aloo Tikki or Panipuri. Samosas, a favourite in the UK, are deep fried stuffed pastries usually containing potatoes and other veg. Aloo Tikki, slightly less common, is a fried potato patty blended with other vegetables and spices. Finally Panipuri, which is a hollow, round deep fried bread which is cut open and filled with chutney, chili, chaat masala, potato, onion and flavoured water. 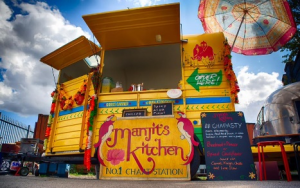 For some top Indian street food take a trip to Manjit’s Kitchen, a food van and café up in Leeds Kirkgate Market, but also making appearances at other events including Sheffield’s peddler market and more. Perhaps not the tidiest of street foods to eat, but Nasi Lemak is a favourite in Malaysia. 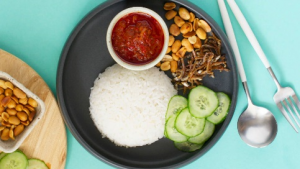 A fragrant rice dish cooked in coconut milk and pandan leaf, Nasi Lemak is usually served with roasted peanuts, crispy anchovies, boiled eggs and sambal (a hot sauce or paste made from a mix of chilli peppers). If you fancy a taste of Malaysia take a trip to Manchester where you’ll find a street food pop up called…. Nasi Lemak! Serving Malaysian street food delicacies, follow them on twitter to find out how to track them down. When it comes to Mexico, you’ve got all the classics we’re familiar with, tacos, quesadillas, tostadas and the likes. But slightly less well known is the Tlayuda. 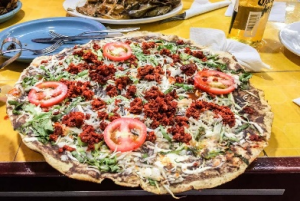 Huge, baked crispy tostadas, Tlayudas are often referred to as Mexican pizzas. Large tortillas are topped with refried beans, tomatoes, avocados and a choice of meat, toasted on a hot plate and served either open or folded in half. Take a trip to just about any street food market in the country and you’ll find a Mexican food stall or truck. Bunny Chow, a hollowed-out loaf of bread to replace a bowl. This south African specialty was originally created to provide an easy way for plantation workers to take their lunch to the fields. The bread is scooped out the loaf and it’s then filled with either vegetable or meat curry. Originally a street food of Durban, the Bunny Chow has grown in popularity in our London street food scenes. 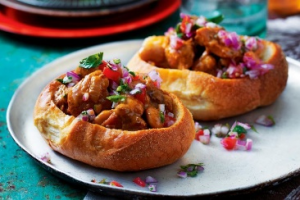 Specialising in this South African delicacy is food truck and stall ‘Now Now Bunny Chow’. With several specialties served in a hollowed-out artisan bread pot, Now Now can be found at various events around the country and are even available for hire.